If you have a career dream that consumes you–it is best to follow your heart and pursue it. As far back as I can remember my dream was to always work with animals. As a teen I began to work as a volunteer naturalist and whale watching host on the beach near my home and on the boats that launched out of the 22nd Street Landing in San Pedro, California. This was in the mid-1970s when the fisherman took groups of Los Angeles Unified School District groups out onto the sea to glimpse the migrating whales and other sea life. It was a novel idea that took hold and that now is a full blown industry that people take forgranted. My association with the Cabrillo Beach Marine Museum (now the Cabrillo Marine Aquarium) was ongoing until I moved too far away to make it an easy to participate–but I kept popping in to help until about 1987 or so. Animal careers have always been a competitive field but they weren’t always glorified positions. In fact, many jobs such as zookeeping, were once considered nothing more than glorified janitorial positions–today they are skilled (and often degree holding) professionals. So, one of the ways to break into a facility was to take any job and then transfer over to the animal department. When I was hired into Marineland it was owned by Hanna Barbera and I entered into the job with high hopes and educational goals of becoming a marine biologist and perhaps a trainer. Instead, I was doing too well in the department that hired me and received a series of promotions until I was one of the managers who was kept on after the summer season. Back then there were not many animal career options in college and the University of California system had something called a “Special Major” which meant you made up the curriculum to meet your needs and got it approved. I knew I was going to go back to school but was taking a year off and I figured the people to ask were those I knew from the park and the museum–all notable experts in their areas of speciality. Today there are a lot of different college program options and areas of specialty to choose from but back then there were no such things as animal behavior degrees, etc., unless you got into a private program. Anyway, I was always around the tanks before and after work. I watched (and picked the brains of) the trainers on site–especially Gail Laule and Gary Fox. Gary encouraged me to enroll in the program known as the Harvard of Animal Trainers and so I applied. In the meantime, I found a private program that trained people to work with wild and exotic animals for the movie and television industry. At the time it was the largest animal training facility in the nation and the main supplier of animal actors to Hollywood. I headed out for the introductory class and enrolled–which ended up being a good thing because the college Gary suggested didn’t even select me for an interview for one of the sixty slots. Even though I had been working training and handling animals for over a year I didn’t make the cut–so I thought the competition was pretty tough and buckled down and eventually moved closer to the ranch. It used to be that animal trainers had a career longevity of seven years but that has changed and many of the people I trained with (and apprenticed under) have their own companies or are still actively training animals. As with any animals, if you are around a lot they get to know you. While at Marineland I met a cast of characters–and not just the humans who donned the hot costumes and who took breaks in our offices. Orky and Corky, the killer whales, would follow me up the ramp to the top of their tank or watch what I was doing as I ambled back and forth. They were stunning animals. At the time Corky had not been successful in rearing a calf and the trainers were busy working at training her with a surrogate to see if her next one might have better luck. 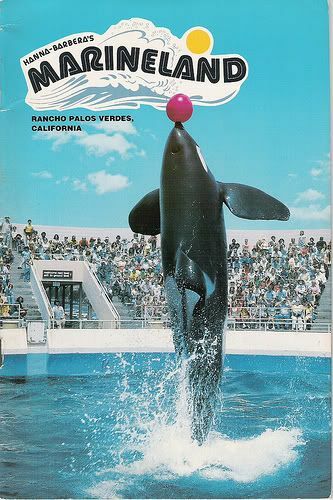 Due to the structure and limited space at the killer whale stadium, I more often found myself at the dolphin stadium, dolphin play pool, or sea lion areas but I spent hours and hours observing behavior and training. Everyone then was pretty accessable and helpful, something I found to be true of many of the marine mammal trainers, but most everyone had been around the park for ages and so the opportunities there were limited. A series of events prompted me to move inland to work with the land animals…and I’ll discuss some of those experiences in the next installment. Thanks for sharing this info and the photos of Marineland–so amazing that you actually were a part of it! 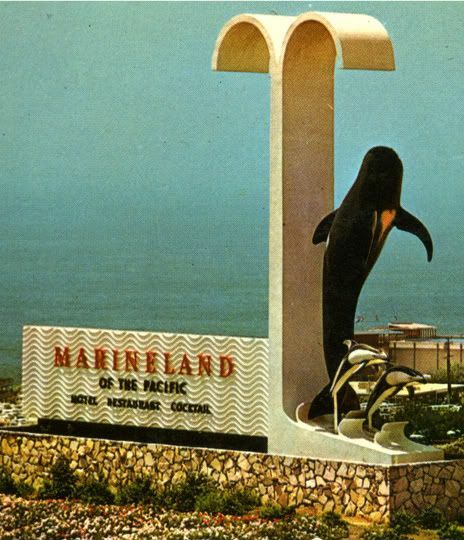 I have been researching Marineland since I found a handful of vintage postcards at a yard sale this summer. It looks like it was a fantastic place; I wish it were still there for us to enjoy. Thanks so much for stopping by to share. Yes, it was amazing. Wish I had taken more pictures then. There is a group on Facebook for former employees and they are having a reunion near the original site in September. You might check it out.